Matchbox Twenty rose to international fame with their debut album, Yourself or Someone Like You (1996), which was certified 12× Platinum (diamond) in the United States and multi-platinum in Australia, Canada, and New Zealand. Their second album, Mad Season, released in 2000, charted in the top three on the Billboard 200 and was certified 4× Platinum in the United States. Their third album, More Than You Think You Are, released in 2002, was only certified 2× Platinum in the United States, despite its singles receiving significant airplay. Director Bill Draheim documented the band throughout the process while making More Than You Think You Are. The documentary "Theresville" was an online extra. The band then went on hiatus in 2004 after rhythm guitarist Adam Gaynor's departure. As a result, Paul Doucette took over rhythm guitar when the band reunited in 2007. They released a compilation album, Exile on Mainstream, which was certified Gold in the United States. After the release, the band toured to support it. Matchbox Twenty then took another hiatus while Rob Thomas embarked on a successful solo career but reunited again in 2010. On September 4, 2012, the band released their fourth studio album, North, which debuted at number one on the Billboard 200. Rob Thomas, Brian Yale, and Paul Doucette were part of the band Tabitha's Secret, which was based in Orlando, Florida, with fellow members Jay Stanley and John Goff, before splitting to start a new band (what was to become Matchbox Twenty). After recruiting Adam Gaynor from Criteria Recording Studios in Miami and Kyle Cook from the Atlanta Institute of Music, the band named themselves Matchbox 20 and earned a recording contract with Atlantic Records. Matchbox Twenty released their debut album, Yourself or Someone Like You, in 1996. While their first single, "Long Day", was a radio success in the west coast, the album soon spawned several Top 40 singles throughout 1997 and 1998, including "Push", "3 A.M.", "Real World", and "Back 2 Good". "Push" and "3 A.M." did not chart on the Billboard Hot 100 chart due to the rule in effect prior to 1998 that required a song to be released as a single in order to appear on the Hot 100. "Real World" and "Back 2 Good" proved to be the band's first entries into the Billboard Hot 100, after the rule was terminated. The album eventually shipped more than 12 million copies in the U.S. alone, achieving a diamond certification. In 1998, Matchbox Twenty recorded a live version of their single, "3 A.M." for release on the charity album Live in the X Lounge, benefiting United Cerebral Palsy research. Before recording their second album, Rob Thomas collaborated with Itaal Shur on a song called "Smooth" for Carlos Santana's comeback album, Supernatural. Thomas was supposed to act only as a songwriter for "Smooth", but Carlos Santana had him sing for it after hearing the song's demo. "Smooth" was the album's lead single and became a hit in 1999. Thomas won three Grammy Awards for writing and performing on "Smooth": Record of the Year, Song of the Year, and Best Popular Music Collaboration with Vocals. During 2000, Matchbox 20 renamed themselves to Matchbox Twenty and released their second album, Mad Season. The album, on the strength of several successful singles, including "Bent" (which peaked No. 1 on the Hot 100 chart) and "If You're Gone", was certified 4x platinum in the United States. The video for "Bent" made fun of singer Thomas' increased fame from "Smooth" by showing the other band members assaulting him. The next two singles, "Mad Season" and "Last Beautiful Girl" were not as successful. For their third album, More Than You Think You Are, the band used more of a pop punk/pop rock sound. Thomas shared the songwriting efforts with the other band members on several songs. The album was recorded at Icon Recording Studios in Hollywood, California. Icon Recording Studios owner and Chief Engineer - Andrew Troy, Assistant Engineer - Aaron Kaplay, 2nd Assistant Engineer - Pablo Solorzano. Additional recording at Bearsville Studios and Hit Factory in New York and was released on November 19, 2002. The album was produced by Matt Serletic, who at the time was the current chairman for Virgin Records. The album again spawned successful singles "Disease" (written with Mick Jagger), "Unwell", and "Bright Lights". The album was not as successful commercially as the previous two, and received mixed reviews from critics. However, the album had an enormous radio presence for well over a year. During 2003, the band released EP, consisting of six songs. The EP featured previously unreleased live and acoustic versions of songs like "Push" and "If You're Gone", as well as a new track, "Suffer Me". In 2004, the band released a live DVD, Show: A Night in the Life of Matchbox Twenty, filmed in Atlanta and featuring 20 songs, including all of their previous successful singles. Before taking a hiatus later that year to allow other members to pursue side projects, such as Paul Doucette's solo band The Break and Repair Method. Rhythm guitarist Adam Gaynor officially left the group. Rob Thomas released a solo album, …Something to Be, which debuted at No. 1 on the Billboard 200. The album featured four successful singles: "Lonely No More", "This Is How a Heart Breaks", "Ever the Same", and "Streetcorner Symphony". In January 2007, Rob Thomas released a single, "Little Wonders", which he wrote for the Disney movie Meet the Robinsons. The group reunited and began performing during 2007, with the release of their 'retrospective' album Exile on Mainstream, on October 2, 2007. "How Far We've Come" was the first single from the new album, which was followed by the second single, "These Hard Times". "Exile on Mainstream" included four other new songs and a complete collection of all eleven of their previously released singles. The album was also released in the new MVI (Music Video Interactive) format, which included two video interviews discussing the six new songs and eleven greatest hits, plus extras including a photo gallery, U-MYX (to remix "How Far We've Come"), buddy icons and wallpapers. "How Far We've Come" was released on the band's MySpace page in July 2007, with the video released on September 6, 2007. Matchbox Twenty toured during early 2008 with Alanis Morissette and opener Mutemath. The band began their US tour on January 25, 2008, in Hollywood, FL, and concluded in Las Vegas, NV, on March 18, 2008 before heading to Australia and New Zealand, where the Australian band Thirsty Merc was the supporting act. Following Australia, Matchbox Twenty visited the UK for the first time in five years to play six concerts in Cardiff, Wembley, Birmingham, Glasgow, and Manchester. Matchbox Twenty performed at the 2008 NASCAR Sprint Cup award ceremony. When the band finished touring later during 2008, Rob Thomas began work on his second solo album, Cradlesong. He stated in an interview to Billboard that he expected that the other members of the band might begin work on Matchbox Twenty's next album without him. At the concert at Mohegan Sun Casino on December 18, 2009, Rob Thomas said that he was not frequently playing Matchbox Twenty songs at his 2009 tour stops because the band was planning to tour together in 2010. At the Taste of Chicago on July 2, 2010, Thomas said that Matchbox Twenty would be recording in the fall for their fourth studio album. On September 4, 2010, while on VH1's Top 20 Music Video Countdown, Thomas stated that Matchbox Twenty was planning to start working on their next studio album in mid-September and that he was 80% sure that the album would be released sometime in 2011. Rob Thomas posted on Twitter that he was "heading out next week to start writing the new mb20 record" on September 13, 2010. It was stated on Matchbox Twenty's web site that the next show they will do together is on January 1, 2011 in Oklahoma. According to Paul Doucette, the new Matchbox Twenty album will likely be completed in the beginning of 2012. He explained, "That's the same question I was asking. We don't know -- the beginning of next year, we hope. It's a real important record for us. We haven't done anything in a long time. The older we get, the more we realize and appreciate the good fortune we have to do what we do at this level. Realistically, how many more times do we get? So we're going to really make this record the one we want it to be." Matchbox Twenty played a one-off live show in Temecula, California on July 9, 2011, but no new material was played. During the show Rob Thomas stated the show was a "love letter to our fans." North was released on September 4, 2012. The album's first single, "She's So Mean," was released on June 12, 2012. In 2012, the band embarked on a worldwide tour, the North Tour, to promote the album. The tour continued as the 2013 Summer Tour, when they co-headlined with the Goo Goo Dolls. On April 9, 2016, Kyle Cook posted a Tweet linked to his Instagram where he announced that he had left Matchbox Twenty. In his statement Cook said, "I wish things were different and I felt differently about it, but several weeks ago I made the other members aware that I am leaving the group. This, however, should not be taken as an announcement of the band's dissolution because I only speak on my behalf. For me, the decision was one that was heavily contemplated and meditated on. Among others, the primary reasons were a deterioration of communication, disagreements on when, where, and how we tour, and a general breakdown of democracy in the group." Matchbox 20 announced via a press release on March 27, 2017 that Rob Thomas, Paul Doucette, Brian Yale, and Kyle Cook have all returned to the band and announced A Brief History of Everything Tour 2017, a North America co-headlining summer tour with Counting Crows. On his personal Twitter account, Cook also announced the tour and the participation of his duo Rivers and Rust as opening act. Also on Twitter, Doucette confirmed Cook's return to the band, while asserting that tour – which is to be a celebration of the band's history – "was always going to happen. It just took a bit for everyone to realize that." Matchbox Twenty's music has been considered pop rock, alternative rock and post-grunge. On their first album Yourself Or Someone Like You the band's music carried an alternative rock and post-grunge sound, the latter term of which was used at the time to describe bands that played a radio-friendly style of grunge. On Matchbox Twenty's later releases they adopted a pop rock sound though still retaining their older alternative rock and post-grunge sounds. Matchbox Twenty has received nominations at the American Music Awards, the Grammy Awards, and the MTV Video Music Awards, but has only received an award at the People's Choice Awards. 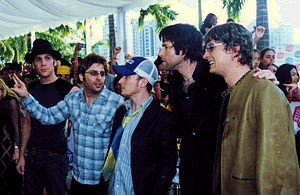 During 2004, the People's Choice Awards gave Matchbox Twenty the award for Favorite Musical Group. At the American Music Awards, the band was nominated for Favorite Pop/Rock Band/Duo/Group twice, during both 1999 and 2003. Matchbox Twenty received a nomination for Best Rock Album twice at the Grammy Awards, for Mad Season in 2001 and More Than You Think You Are during 2004. Overall, Matchbox Twenty has received one award from 12 nominations. The APRA Awards are a series of annual award ceremonies created by Australasian Performing Right Association from 1982. The Grammy Awards are awarded annually by the National Academy of Recording Arts and Sciences of the United States. The MTV Video Music Awards is an annual awards ceremony established during 1984 by MTV. The People's Choice Awards is an awards show that has been performed annually since 1975. ^ "Releases: Matchbox 20". Retrieved September 8, 2012. ^ "Matchbox Twenty Sued Over Album Cover". contactmusic.com. Retrieved 9 January 2019. ^ "'Rob Thomas gets worldly on new solo disc". Billboard.com. Retrieved 2009-09-25. ^ "One night only: Matchbox Twenty". SignOnSanDiego.com. 2011-07-07. Retrieved 2011-09-13. ^ "Matchbox Twenty Official Site". matchboxtwenty.com. Retrieved 2011-04-20. ^ "Matchbox Twenty to release She's So Mean single on June 12". Rekwired. 2012-06-06. Retrieved 2012-06-06. ^ Williams, Nick (November 12, 2012). "Matchbox Twenty Announce 'North' Tour 2013 Dates". Billboard. Prometheus Global Media. Archived from the original on January 26, 2013. Retrieved January 26, 2013. ^ Tarradell, Mario (April 9, 2013). "Concert announcement: Matchbox Twenty and Goo Goo Dolls co-headline Gexa Energy Pavilion show July 31". Dallas News. ^ Union, Wonderful. "Official Site". Matchbox Twenty. ^ Kyle Cook [@StalkingKyle] (27 March 2017). "You heard it right. We. Are. Back! !#ABriefHistoryTour @MatchboxTwenty @CountingCrows and @RiversRust…" (Tweet) – via Twitter. ^ Paul Doucette [@RepairMethod] (27 March 2017). "@o_rolf Kyle is back!" (Tweet) – via Twitter. ^ Paul Doucette [@RepairMethod] (27 March 2017). "@GillPill77 no. This is a tour celebrating our history" (Tweet) – via Twitter. ^ Paul Doucette [@RepairMethod] (27 March 2017). "@ThisIsMrsArty @GillPill77 this was always going to happen. It just took a bit for everyone to realize that" (Tweet) – via Twitter. ^ a b c d "Matchbox Twenty". Rock on the Net. Retrieved 2008-10-19. ^ "25th American Music Awards". Rock on the Net. Retrieved 2008-10-19. ^ "26th American Music Awards". Rock on the Net. Retrieved 2008-10-19. ^ "30th American Music Awards". Rock on the Net. Retrieved 2008-10-19. ^ "APRA Music Awards 2009". Australasian Performing Right Association (APRA). Archived from the original on June 25, 2014. Retrieved April 28, 2010. ^ "2009 Winners - APRA Music Awards". Australasian Performing Right Association (APRA). Archived from the original on January 12, 2010. Retrieved April 28, 2010. ^ "40th Grammy Awards". Rock on the Net. Retrieved 2008-10-19. ^ "43rd Grammy Awards - 2001". Rock on the Net. Retrieved 2008-10-19. ^ "46th Grammy Awards - 2004". Rock on the Net. Retrieved 2008-10-19. ^ "1998 Video Music Awards". MTV. Retrieved 2008-10-19.